Born and raised in New York City, Barney eventually found his way out West where he graduated from the University of San Francisco with a B.A. in Media Communications (May 2000). 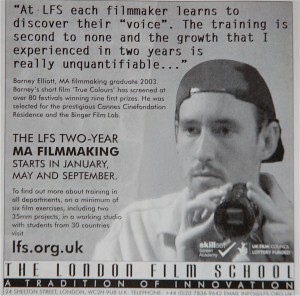 Set on making movies, 3 years later Barney graduated from UK’s Covent Garden based The London Film School where he earned his degree in The Art and Technique of Filmmaking. In May of 2006, Barney wrote and directed True Colours: a short film about people’s perception of others. The film premiered in January of 2007 at Premiers Plans Festival d’Angers (France) and earned both the Special Jury Award and Best Actor in Short Award. Over the next two years True Colours went on to screen at nearly 90 international festivals and earn many more accolades. Much due to the international success of True Colours, Barney was one of the 6 selected writer / directors for the Cannes Cinefondation writing fellowship (La Residence). He resided in Paris for five months (October, 2007 – February, 2008) and wrote the first two drafts of his first feature script The Debt. In 2009, Barney received his diploma from the Binger Film Lab: the prestigious 5-month writer’s workshop in Amsterdam, The Netherlands. It was there that he finished writing The Debt. In 2016, The Debt, starring Stephen Dorff, David Strathairn, Carlos Bardem, Alberto Ammann and Executive Produced by Christine Vachon, won several awards on the festival circuit and followed with a theatrical release in the US and several South American countries. Currently the film is available on digital demand as well as Netflix. Barney has resided in Lima, Peru with his wife and daughter since 2009.